The American and Bridal Veil Falls, viewed from Canada. Canadians may have the better view, but Americans can get a lot closer! 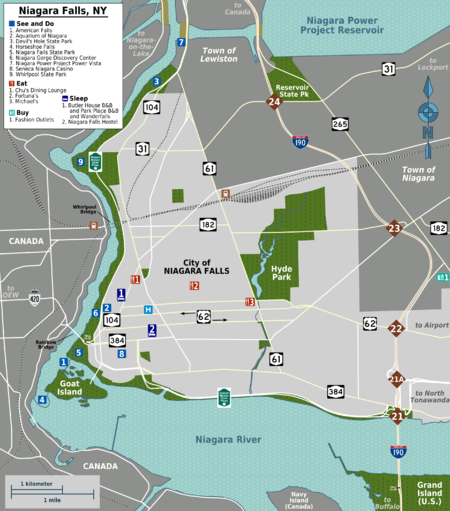 Niagara Falls  is in the Niagara Frontier region of New York state. The Niagara Falls consist of three sections. The large Canadian falls – with their distinctive curved shape – are also known as the Horseshoe Falls. They are separated by Goat Island from the American Falls, which are separated by a small island at their south end, from the narrow Bridal Veil falls. Each side of the falls offers a different perspective, and it is always best to visit both sides to maximize your experience. The American side gives a side-on view of the American Falls, and an observation point only 20 yards from the top of the falls. Although the Canadian side is touted for having the best view, the American side is a State Park, the oldest in the nation, so efforts have been made to preserve the natural beauty of the area and prevent the kind of commercialization that you'll find on the Canadian side. Visitors looking to experience the falls as a natural wonder will appreciate this. Buffalo-Niagara International Airport (IATA: BUF), in Buffalo is a major airport, with flights across the United States. It is about 30-40 minutes away. Buffalo Airport Shuttle, 716-685-2550,  offers service from the Buffalo-Niagara airport to Niagara Falls. A family of 4 can expect to pay $22 per person and the drivers often have great tips on where to go and what to avoid. BUF Buffalo Airport Taxi Service, 716-292-4425,  Provides Airport Taxi service from the Buffalo-Niagara airport to Niagara Falls. Expected cost will be 65$ for 1-7 people and only one person will be charged. Niagara Falls International Airport (IATA: IAG) is the closest airport to the falls, but it is served by only one commercial airline, charter, and private flights. DirectAir  has regular direct flights to Ft. Myers, FL and Myrtle Beach, SC. On-site airport parking is free. John C. Munro Hamilton International Airport (IATA: YHM) is about a one-hour drive west of Niagara Falls in the Canadian province of Ontario. The airport hosts low-cost Canadian carrier WestJet which offers frequent flights all over Canada. In addition, Transat Holidays offers weekly direct flights to Cancun, Mexico and Punta Cana, Dominican Republic. Toronto Pearson International Airport (IATA: YYZ), in Toronto is about a 1 1/2 hour drive from the falls. However, expect to deal with heavy traffic in the Toronto area which could make the trip much longer. Cleveland Hopkins International Airport (IATA: CLE), in Cleveland is around 3 hours drive from Niagara Falls, but is a hub for United Airlines, and has direct flights to many destinations. It is another opportunity to seek out cheap fares into the region. Amtrak's Niagara Falls station (NFL) is served daily by the Empire Service from New York City and the Maple Leaf from both New York City and Toronto. From Buffalo-Niagara International Airport: Take the I-90 East to the I-290 West to the I-190 North. Take the I-190 North (over both Grand Island Bridges, $1 toll) to the Robert Moses Parkway. From Toronto Pearson International Airport: Take Highway 427 S to QEW towards Hamilton. 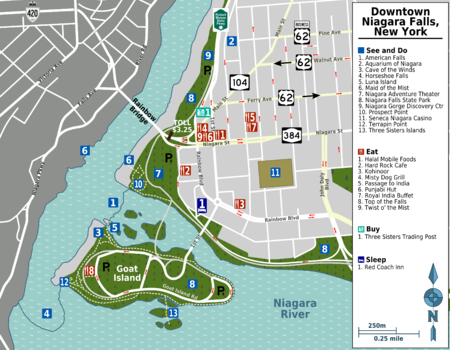 Drive for about 60 mi (100 km) and then keep left to take the Regional Road 420 E/Roberts Street toward Niagara Falls Bridge to U.S. Continue onto Falls Avenue and then cross via Rainbow Bridge. Roberts Street changes to State Route 384/Niagara Street once in the U.S.
From New York, Boston, and the East Coast: Take I-90 W towards Buffalo to the 290 W. Exit onto the 190 N towards Grand Island and Niagara Falls. Follow I-90 N through Grand Island, then take exit 21A immediately after the North Grand Island Bridge (as you're leaving the island) for the Robert Moses Parkway. Continue until in downtown Niagara Falls. From Chicago and the Midwest: Take I-90 East towards Buffalo to the 190 W. Follow signs for Grand Island and Niagara Falls. Follow interstate through Grand Island, then take exit 21A immediately after the North Grand Island Bridge (as you're leaving the island) for the Robert Moses Parkway. Continue until in downtown Niagara Falls. NFTA bus line #210 runs every 2 hours between Buffalo Niagara International Airport and Niagara Falls. Currently it is scheduled until June 30th. See schedule at NFTA's website. You can really do a lot without a car once you get to the immediate vicinity of the Falls. If you are staying downtown you may be able to get by without a car. The toll for walking the Rainbow Bridge westbound to Canada is $1.00 (both U.S. and Canadian currency accepted), paid on the Canadian side coming into the U.S. (There is no eastbound toll.) If you travel with any baby carriage, you pay no extra toll. Do not photograph or film on the Bridge without getting Bridge Commission approval and signing a liability wavier first. You cannot walk across the Lewiston-Queenston Bridge. Bicycling can be faster than walking to get around. The toll for bicycling and walking the bridge across the national border is the same. On the bridge sidewalk, bicyclists are officially supposed to walk their bikes, but you may bicycle on the far right lane of the Rainbow Bridge and Lewiston-Queenston Bridge like a car. Car is a convenient option to get around, and to see the attractions surrounding the Falls. There is ample parking on the American side of the falls, and parking on the American side and walking across the bridge may be an attractive method of getting to the Canadian side for a day trip. If parking in the downtown falls area, there are clearly posted signs which should direct you pretty hassle-free to the tourist area. Most shops and attractions are within walking distance from the downtown falls area. If you want to see the Canadian side, you can cross at the Rainbow Bridge (downtown) or the Queenston-Lewiston Bridge (north of the city). Be sure you have proper documentation for yourself (passport or other approved alternative) and your vehicle (registration, insurance card, etc...) If you're driving a rental car, pay particular attention to your rental contract. Unlike with Mexico, most national rental outfits don't have an issue with you traveling into Canada in it of itself - however there's a decent chance that Canadian travel is not included in your unlimited millage area, (unless the rental originated in New York State) and surcharges may apply. Remember, you can always park in downtown Niagara Falls, NY and walk across the Rainbow Bridge to enjoy the sights there. NFTA bus #210 travels a little around the Falls area. Other bus routes run in the area, for example to Buffalo. NFTA route #210 no longer exists. See http://metro.nfta.com/Routes/ for the most current information. Views of Niagara Falls are free and accessible. Access to the riverside walks and parks offer great views. You can walk across to Goat Island on the pedestrian bridge. There are a number of attractions designed to give different experiences of the falls. You can combine all the above attractions with a Niagara USA Discovery pass for $35, which you can purchase at the attractions. Whirlpool Tours in nearby Lewiston is a jet boat ride that will take you to the falls. Helicopter Rides Howard Johnson's on Rainbow Blvd. Must stay a night and see the night view of the Niagara Falls. It is equally beautiful. Niagara Falls State Park, . Niagara Wine Trail, . Not at the Falls, but within driving distance. Lockport Locks & Erie Canal Cruises  Not at the Falls, just a 1/2 hour drive east via Rt. 31. 1 3/4 hr long narrated cruises on the historic Erie Canal. Gray Line Niagara Falls, +1 877-285-2113 (toll-free), , [email protected]. Gray Line provides fully guided tours of Niagara Falls (USA & Canada) multiple times a day. See Sight Tours of Niagara, +1 888-961-6584 (toll-free), . Provides fully guided and narrated tours of Niagara Falls. Half-day and full-day tours available. Pickups anywhere in Niagara Falls, Ontario. Admission tickets, parking, and all related fees are covered. Bedore Tours, 1-800-538-8433, . 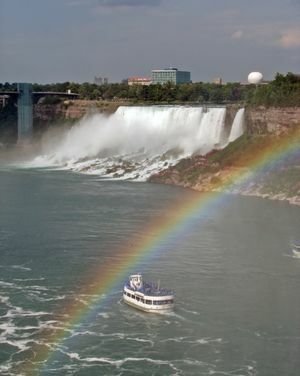 Sightseeing tours of Niagara Falls USA and Canada. Magic Mist Limousine, 1-800-689-8189, . Private Sightseeing tours of Niagara Falls USA and Canada by limousine. The Mob Tours, . Historic sightseeing tours of former crime family homes, hideouts and people by bus. Dare Devil Tours, 1-800-599-2088, . Limousine tours highlighting the real life stories of people who challenged Niagara. Helicopter Tour,  - it's an awesome experience though the charge of $90 may seem like a lot for a 15 minute ride. There are outlet malls, which may be of interest to bargain hunters crossing the border. 2591 Miliary Rd, ☎ +1 716 297-7198. 10AM-midnight daily, drive-thru Su-Th 10AM-1AM, F Sa 10AM-2AM. 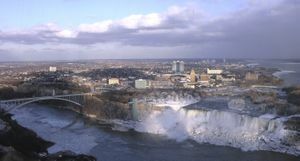 The drinking age in New York is 21, however, due to the fact that Niagara Falls straddles the border, 19 and 20 year-olds may cross the border into Canada to legally drink. Alcohol is more expensive in Canada. Oliver Street was in the Guiness Book of World records for many years for having the most bars on one street. Upwards of 100 bars are still on Oliver. One of the best being Soos's bar (now called Witter's Sports Bar and Grill). Oliver Street is located in NT (North Tonawanda) about 15 minutes from the Falls. At the end there are many things to do, such as roller skating, tattoo shops, the Riviera Theatre and more.3rd Street is a little strip with clubs and bars. There are not really any major luxury hotels in the area, but a new hotel is now at Seneca Niagara Casino. There are several other nice-looking hotels downtown by the Falls, and then a series of motels on Niagara Falls Boulevard, including several $20/night fleabag specials (where they really always charge you more than that anyway). Downtown, the best hotels are Seneca Niagara Casino & Hotel, Doubletree Hotel & Conference Center, and The Red Coach Inn. Radisson on the River is coming soon on Buffalo Avenue and is located on the Niagara River overlooking the North Grand Island Bridge. There are several B&B's: Butler House, Park Place B&B, and the Elizabeth House. Lewiston also has a nice looking B+B, but this is a little drive from everything (very cute little town however). Niagara on the Lake is always worth the drive (Canada). The Niagara Falls area code is 716 for the entire area. The area immediately surrounding the Tourist area is not safe for tourists to walk in most times of the day, however you are generally safe in a car, keeping door locked and windows up, valuable out of sight. Do not walk east or north from the Casino. South of the casino you will enter the industrial corridor, which you should have very little reason to venture into. Traveling north from the falls toward the Aquarium is generally safe, though entering the neighborhood across the street should be avoided, again you should have no reason to enter this area. If you are going to walk out of the tourist area stick to the main drags, 3rd street to Main street (rt 104) to Pine avenue (Bus 62) don't turn down Walnut ave (62) by accident. Neighborhoods change very quickly in Niagara Falls. Pine avenue (Bus 62) is generally safe during daylight and as the street numbers increase (north-south streets are numbered) the safety factor increases. Pine avenue east of 22nd Street is generally safe, and the entire LaSalle/Prime Outlets area (east of I-190) is for the most part safe at all hours, however following general precautions that would apply in any urban area: locking car doors, keeping valuables out of sight, being aware of your surroundings, etc. is the rule—and you should be fine. There are numerous other waterfalls in western New York (all much smaller), notably the 3 falls of the Genesee River within Letchworth State Park. Old Fort Niagara, a historical site, is around half an hour to the north, and Buffalo is about half an hour away. You can travel to the Canadian side for a closer view of Horseshoe Falls and to visit the other attractions in Niagara Falls, Ontario and Niagara on the Lake, although you will need a passport or another document proving both identity and citizenship, the main Canada article covers documentation requirements and crossing the border by land in depth. Lewiston is just to the north, and is usually visited as part of a trip to the Falls. Lewiston's Artpark State Park has a popular open-air auditorium in addition to the normal park activities. Lewiston also has The SandDocks and the Niagara Escarpment on Lewiston Rd. This page was last edited on 11 July 2018, at 17:47.